On April 2, EPA Administrator Scott Pruitt announced his intention to weaken Obama-era fuel economy standards for cars and light trucks. Details of the draft proposal, leaked to the Los Angeles Times, indicate that the administration aims to freeze standards at 2020 levels through 2025. We model the impact of such a move and find it will be highly dependent on future oil prices. The footprint-based system of Corporate Average Fuel Economy (CAFE) standards gives automakers significant flexibility to comply, even when gas is cheap and drivers opt for larger, less efficient cars. But low oil prices also make the standards themselves more important as a driver of fuel economy gains – and the emissions impact of rolling them back more severe. One of the first steps taken by Trump’s EPA last year was to announce its intention to reopen federal fuel economy and GHG emission standards for passenger vehicles for model years (MY) 2022-2025. Administrator Pruitt’s revised Final Determination of the mid-term evaluation concluded the regulations “present challenges for auto manufacturers due to feasibility and practicability, raises potential concerns related to automobile safety and results in significant additional costs on consumers, especially low-income consumers.” Last month’s announcement overturns a last-ditch effort by the Obama administration to shore up the standards — and signals EPA’s intention to launch a new notice and comment rulemaking process to modify the standards. EPA and the National Highway Traffic Safety Administration (NHTSA) are poised to complete the first step in that process: delivery of a draft proposal for White House approval before being made available for public comment. Leaked details of the draft, published by the New York Times, suggest the agencies plan to provide several options for slowing required fuel economy improvements. Their preferred route would roll back standards significantly more than automakers requested. It freezes standards for cars and light trucks at 2020 levels, a sales-weighted average estimated around 36 miles per gallon (mpg). The draft proposal also appears to confirm that EPA intends to challenge California’s authority to impose its own, more stringent standards. Automakers have raised concerns about splitting the US into two distinct auto markets. Until now, EPA seemed inclined to agree, preferring a single, harmonized system. However, among the leaked details is an argument that California’s waiver does not allow the state to set its own fuel economy standards. The state has made clear it will defend its authority to set more stringent rules. This battle may shift to the courts, extending the uncertainty for automakers. With a dozen other states and the District of Columbia following California’s lead, that means standards that have sway over one-third of the US auto market could remain in limbo for years to come. Until the Administration’s proposal becomes public, we will not know just how much it will set back progress on fuel economy. Much depends on whether California’s more stringent standards are allowed to stand. Future oil prices will also play a major role in determining the impact of a federal rollback on fleetwide fuel economy. Because CAFE standards are based on vehicle footprints, the ultimate impact of the standards depends in large part on which types of cars people buy. That, in turn, depends on prices at the pump. Higher prices push consumers toward vehicles with a smaller footprint, increasing fleetwide average fuel economy. When prices are low, as they are today, Americans buy bigger cars and the fleetwide average declines. Last year, light trucks made up 65% of total vehicle sales. That is up from about 50% in 2012 when oil prices were at their peak. CAFE standards allow automakers to cater to these trends, producing more vehicles within the larger footprint category. Just last week, for example, Ford announced it would discontinue all but two of its sedan models, focusing instead on its more lucrative F-Series trucks, SUVs, and crossovers. When EPA and NHTSA set the current CAFE standards in 2012, they estimated fleetwide fuel economy would reach 54.5 mpg by 2025. The agency relied on oil price forecasts from 2011, a few years before the shale boom helped contributed to a sharp drop in global oil prices. In their Final Determination on the MY 2022-2025 rules, completed in January 2017 after oil prices had dropped to half their peak, the Obama Administration EPA revised its 2025 estimate downward to 51.4 mpg. EPA based this change largely on lower oil price projections by the U.S. Energy Information Agency (EIA) in its 2015 Annual Energy Outlook (AEO2015). While fleetwide fuel economy improvements are slower when oil prices are lower, standards play a more important role in driving improvements than oil price-driven changes in vehicle purchase decisions and manufacturer investments alone. Indeed, that is one reason auto companies are pushing now to weaken the standards – because with lower oil prices the standards are now beginning to bind. 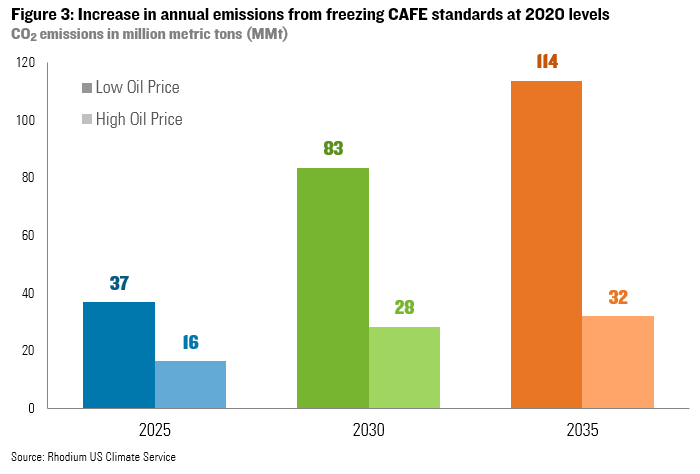 To estimate the potential effect of the proposed CAFE freeze, we modeled the original Obama-era standards and the proposed federal freeze under the reference, low, and high oil price scenarios in EIA’s AEO2018 (Figure 1). This captures a pretty wide range of potential oil prices – from $32 a barrel to $158 a barrel West Texas Intermediate Crude Oil Prices (WTI) in 2017 dollars. In the reference scenario, crude oil prices rise from just under $70 today to $83 in 2025 and $89 in 2030. To get a sense of the full potential of the Administration’s proposal, we also assume California and other states are prevented from implementing their own, more stringent standards. We used RHG-NEMS for this analysis, a version of the EIA’s National Energy Modeling System maintained by Rhodium Group. The high level of detail in the RHG-NEMS transportation module allows us to capture footprint shifting at different oil prices. This provides consistency with the EPA’s regulatory impact analyses, which also use the National Energy Modeling System. Under Obama-era standards, fleetwide fuel economy rises from 32 mpg today to between 44 and 46 mpg in 2025, depending on the price of oil (Figure 1). Without updated standards after 2025, fuel economy improvements level off at lower oil prices and grow modestly at higher oil prices. 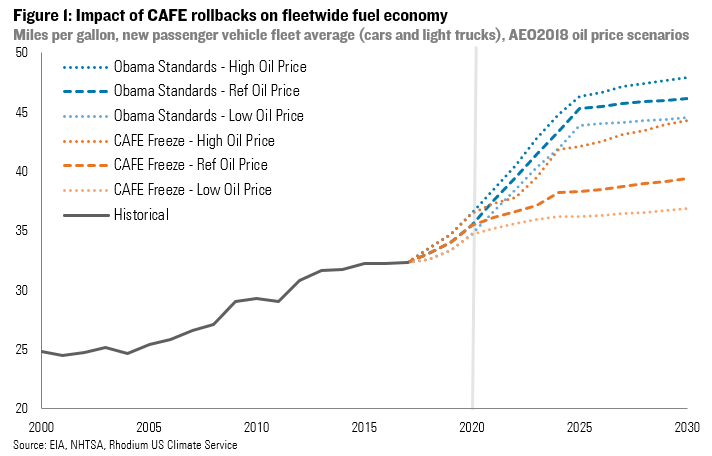 If the Administration proceeds to freeze CAFE standards at 2020 levels, the fleetwide average reaches only about 38 mpg in 2025 under AEO 2018 reference oil prices, 36 mpg in a low oil price environment and 42 mpg under high oil prices. 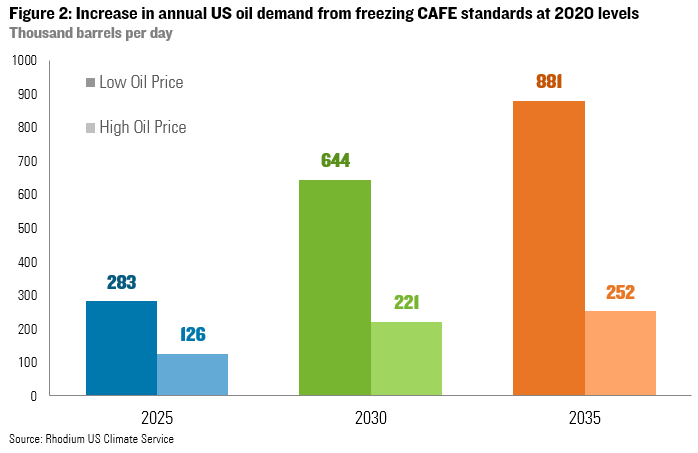 Freezing CAFE standards at 2020 levels would increase US oil consumption by between 126,000 and 283,000 barrels per day in 2025, depending on oil prices. By 2030 the impact grows to 221,000-644,000, assuming no change in post-2025 standards, as more of the vehicle fleet has been sold under the MY 2020-2025 rules. By 2035 US oil consumption is between 252,000 and 881,000 barrels per day higher. The upper end of the range equates to more transportation oil consumption than currently occurs in any state other than California and Texas, and more than total annual oil production in Alaska. Purchasing this oil would cost drivers an additional $193 to $236 billion cumulatively between now and 2035, again depending on oil prices. This increase in oil consumption has modest GHG emissions implications in 2025 relative to recent power sector developments, but the magnitude grows over time. In 2025, US energy-related carbon dioxide (CO2) will be 16 to 37 million metric tons (MMt) higher if CAFE standards are frozen at 2020 levels. That translates into a 0.3% to 0.7% change in overall US GHG emissions that year based on projections in our Taking Stock report from last spring. By 2030 this grows to 28 to 83 MMt, again assuming there are no post-2025 standards in place. By 2035 the gap widens to 32 to 114 million metric tons depending on oil prices. These emissions and oil consumption estimates look at the impact of MY 2021-2025 standards only. However, if the Administration freezes those standards at MY 2020 levels, it will also impact post-2025 standards. Should a future administration consider revising the standards, this move would lower the starting point and delay low-carbon research and development, in addition to manufacturing investment by American automakers. This points to a much more significant long-term effect. If the Administration does succeed in freezing standards at 2020 levels, it will increase the incentive for California and other clean vehicle states to think creatively about new vehicle decarbonization approaches.